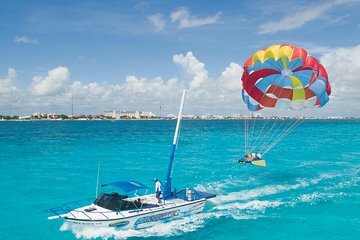 Stige højt over det skimrende hav og tårnhøje hoteller i Cancun under et spændende 30-minutters Cancun Parasailing Adventure. Se feriestedets mest spektakulære seværdigheder fra et unikt perspektiv og flyve med en ven i en parasail, der komfortabelt pladser to passagerer. Føl dine adrenalinniveauer dybe, når du starter i luften og stirrer i den spredte by under din spændende oplevelse. Lav din egen vej til en forudbestemt beliggenhed på Cancun kysten og klat ombord på en afventende båd. Lyt som din ekspertinstruktør leverer en informativ orienteringssession, så spænde ind i parasailen, så snart du føler dig sikker. Føl dine adrenalinniveauer stigning, da rebet langsomt udgives, og du stiger op til 350 meter (105 meter) over det iriserende hav. Gaze ned ved den tætte tropiske jungle, den idylliske Isla Mujeres-øen og de innovative strukturer i hotellets zone. Alternativt kan du vælge lagunen for at svæve højt over farvandet i Nichupte-lagunen. Nyd den betagende udsigt over byen, mens du føler bygninger direkte under dine fødder. Efter din spændende oplevelse skal du vende tilbage til tørt land og bede din guide farvel ved det oprindelige afgangssted. Wow! This was fun and a highlight of our visit to Cancun. amazing i had so much fun! I paid for this on viator 03/23 and realized on 03/24 I had entered the wrong date. The local office was already closed so I sent a message through viator asking if it would be ok to come on the 24th because I never registered for a time. I tried calling but I stayed on hold and someone kept hanging up. So much fun, and a great experience! We loved every minute of it and were very happy with the service and quality we received at Aqua World! Kept being sent from one place to another...finally after one of the people spent about 30 mins on the phone they accepted our voucher. I would not recommend this to anyone. Rather you buy your parasailing adventure locally on the spot. 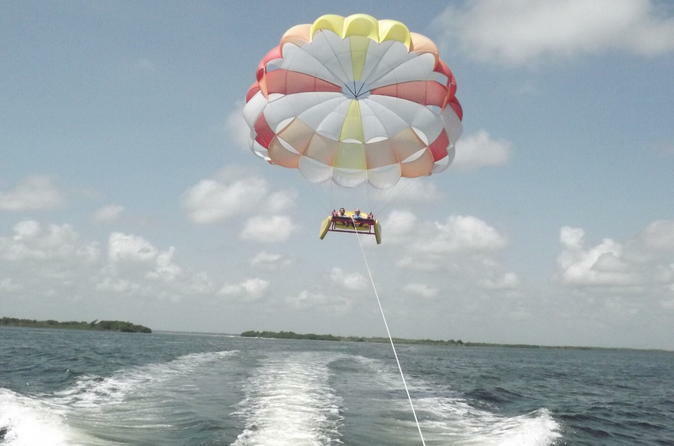 This was a GREAT parasailing experience! It was a little confusing to get to the correct place- we were given a hotel name, and there ended up being 2 hotels with the same name within half a mile of each other. We waited a while at the wrong hotel before I had to call and clarify again. However, the experience itself was great. We had 3 adults, we fit comfortably in the bench. They also take photos and video that is available for purchase. The staff was all great, very kind and made the experience fun. Loved it! The staff was nice and the parasailing over the lagoon was really calm and nice. Not easy to find and bring a change of clothes because you will walk out to the small boat in chest deep water. The small boat will take you to the larger boat. This was a nice thing to do with my 5 year old. I think my older kids 16 and 13 would of liked the harness as opposed to the cart. The staff was great for our safety they delayed us while the sky cleared up and I appreciated it! They were helpful and did a great job!